Thanks to Nemesis I am now watching Masterpiece Theateron Sunday nights. To accompany my TV viewing I either eat low-fat ice cream or air-popped popcorn. Sometimes I work on counted cross stitch. Then I make sure I take my fiber pills before going to bed. A few days ago I was going to post about stressed out I was feeling, but then I made some decisions and I don't feel so stressed anymore. First of all, I got an offer to teach at a second school. However, this school is about an hour away (more with traffic) and the class conflicted with one I had already agreed to teach. I thought my first class wasn't going to happen, because it only had two students when I left on vacation. Then I looked again and started to panic, because there were six students. I was feeling really freaked out about starting at a new school, driving that far two nights a week, and screwing over my first employer. So I told the second school that I couldn't do it. And I felt a lot better. I haven't even felt guilty about the fact that they start next Wednesday. Saying "no" appropriately is a great way to reduce stress. I read another blog post today bemoaning those "cheesy Christmas letters that everyone sends to brag about how perfect their family is". I felt a little defensive because our annual Christmas letter has become a treasured family tradition for Mr. Fob and I. And, while we do tend to highlight the good things, we really don't send it out to brag. We've been having a little trouble with getting this year's letter written and sent out on time, partly because we don't have a decent picture and partly because we're trying to find the best way to talk about what's been happening with us this year. I like to be honest about ourselves, but I also feel like we don't have to tell everyone every gory detail of our lives. Christmas is a time of peace and optimism, so I think our letters should reflect that. The one hard and fast rule in my house for Christmas morning was that you could not wake up Mom and Dad. They didn't care how early we got up, but we had to wait for them to get themselves up and ready before we could open presents. The wait was always excruciating. "Santa" usually left out one of our bigger gifts all assembled and ready to play with. Plus we got a special treat in our stockings: mini boxes of sugar cereal. The only day of the year when Fruit Loops and chocolate coins were an acceptable breakfast. When it was time to open presents, we would go around in a circle and take turns. I like doing that because it prolongs the process and you can watch what everyone else got. How do you do presents in your house? I just remembered that there was a year when I was in college that my parents managed to get up and dressed before any of the rest of us did. You know everyone is getting older when the parents actually have to drag the kids out of bed to open presents! I guess we could call this post "Christmas Music Part 2". Last night at the party we were discussing what the worst Christmas songs ever were. No one brought up this one. My sister actually once had to do a tap dance routine to this song, complete with a felt hippo face safety pinned to her shiny red leotard (I think she was about 5 or 6). 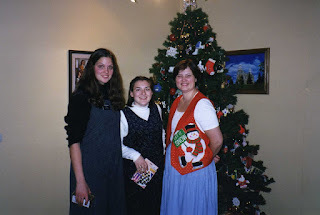 Speaking of dance, another family tradition we had was attending a performance of The Nutcracker each year. My mom also used to make new dresses for my sister and I each year for Christmas, so the performance was a good opportunity to show off our new clothes. When I was thirteen I got to wear pantyhose and high heels for the first time. That was exciting for a few months afterward, but then I figured out how uncomfortable true beauty is and gave up that habit. I wore white pumps with frilly ankle socks to my eighth grade graduation--I'm just a fashion rebel like that. Christmas music is a very important part of most people's feelings about the season. The interesting thing to me is how much the type of music varies from family to family. Growing up, I mainly remember two records that we listened to every year: Willie Nelson's Pretty Paper and another by some group of singers whose name I can't remember. That album had cool stuff on it like "What Are You Doin' New Year's Eve? ", "Be a Santa", and "Do You Hear What I Hear? "; some day I want to dig out my parents' old record collection and figure out what it was. We also had (and still do have) the big Reader's Digest Christmas Songbook, and the rule was that you couldn't start playing that until after Thanksgiving. One of the fun things about visiting my parent's house was the opportunity to see all of my mom's nativity sets. She's a big fan of "Jesus is the reason for the season" and has collected sets for years. This is a set I made for her when I was ten years old. I remember that for years during high school I was deeply embarrassed when she would show it off to people. All I could see were the imperfections (like the cardboard sheep with one leg). The funny thing is, seeing it for the first time in at least six or seven years, I was impressed with how well it was made. Heck, I was 10 and I came up with it all by myself. I guess I must be growing up after all. I already posted last year about my feelings about Santa. He just wasn't a big deal in my house growing up, and I don't remember ever thinking of him as an actual, real being. One year, however, my sister and I got a note from Santa. I'm pretty sure I was seven that year, so my sister would have been six. We had asked for My Little Ponies that year, but instead we got a nice note from Santa explaining that so many children had asked for Ponies that we would need to wait until January 25th to get ours. So we played with our other presents and waited patiently. Then, on January 25th, we got our Ponies. I remember now being puzzled by the note because I was pretty sure that Santa wasn't real, but I hadn't really figured out that my parents left the presents. And I'm pretty sure that at that point in my life I didn't recognize my mother's handwriting. I wish I had saved that note because I sure would like to look at it now. One tradition my family started at some point during my childhood was a tree decorating party. We didn't invite anyone else but ourselves, but always had fun food that my mom didn't normally buy. She'd even break out the punch bowl and we'd make some punch. We're not exactly a fancy cheese sort of family; our traditional foods lean towards chips and salsa and Lil' Smokies with barbecue sauce. Yum. Last night my parents had our party and the kids got to help decorate the tree. Actually, Little Dude worked on seeing if he could eat more Lil' Smokies than my dad, and S-Boogie helped decorate the tree. It was a lot of fun. I haven't had Christmas at my home for a while and it's fun to do some of the old traditions, even if none of my siblings were here. This is Little Dude in his "cage". We're glad we didn't have to bring our playpen with us, but the free crib from the motel was quite interesting. I kept wanting to sing our favorite Stephen Marley song: "Let me out, let me out, I'm an angry lion". On Sunday we were getting ready for church and I was trying to find my tights. S-Boogie had gotten herself ready earlier and was wearing a pair of tights that were too big. I assumed she had borrowed them from her older cousin so I thought I'd just let it go. Then I looked in the suitcase and realized that she had put on my tights. It was hard to convince her to switch because I couldn't wear hers. I think I write a post before every trip about how stressful it is to pack and get everyone ready to go. We're leaving tomorrow after S-Boogie gets home from school and will drive part of the way before stopping for the night. The main thing I'm stressed about is that we finally got the movie Volver from the library and if we don't watch it tonight we'll have to wait another four months. Of course, we could also just rent it and watch it with my parents. They might like it. About four years ago, when S-Boogie was a tiny baby, I typed some parenting concern into Google looking for advice. One of the search results was a thread on a message board that catered to other LDS moms. I was immediately hooked; I'd never used message boards before, but as a new mom I loved the interaction with other moms. However, after a year or so of spending time on the board I started to grow disillusioned. I never really felt like I fit in, and I often felt like my comments were ignored or dismissed. At the same time, several of my friends started blogs and I happened to stumble onto Dooce. This seemed like something even better than a message board--I could write whatever I want and people would actually listen to me. I hoped that blogging would help me improve my writing skills and emotional awareness and that it would be a way for me to preserve a bit of my life history somewhere. I'd always assumed this book was from the nineteenth century until I checked it out and realized that it was written in the 1970s. I also realized after reading it that I probably would have loved it when I was ten. Instead I read it in about an hour and wasn't all that impressed. It was an intriguing premise, but the book felt like it could have done so much more with the idea. This is over a week late, but at least you can use these for next year. Or make some of them now for dinner; they're all great. Turkey Breast: I bought a small turkey breast (5 pounds) and tried the Alton Brown method of brining and starting it at a high temperature. I cut the brine recipe in half and soaked it in a large tupperware container in the fridge for a few hours in the morning. It also didn't get very brown due to the fact that after 20 minutes the pan broke. But it still turned out very tasty and juicy. I think the best thing that helped was using a meat thermometer. The turkey was at the right temperature much earlier than I had expected. Stuffing: This year I used Trader Joe's stuffing mix. It was pretty good, but a little dry for my taste. It also made a lot, which was fun for leftovers. I've probably done stuff like this before, but I figured I'd jump on the bandwagon since threeof myfriends have done it. 1. Getting ready for finals. Hating myself for taking dumb classes like Psych 101 or History 122 just because they sounded "fun". 2. Working for the Youth and Family Programs office. At this point in the year I think we would have been gearing up to get ready for EFY registration by phone. 3. Going to College Bowl practice a lot. 4. Finding a Christmas present for the boy I wasn't really waiting for (we didn't really date), but was writing on his mission. I don't remember what I sent him, but I must have sent him something. 5. I honestly don't remember anything else from this time in my life. 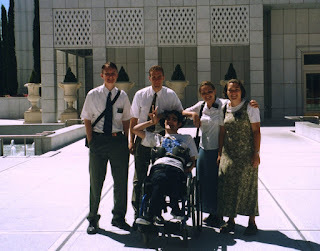 It was my second year at BYU and nothing much happened that year that was too memorable. Oh, one of my roommates that I had also roomed with freshman year was engaged. Uh, yeah, that's all I remember. As usual, I have a bunch of great ideas for posts and no time to get them written down. One of these days I'll get my Thanksgiving recipes up here. I even took pictures of the food. This week and next week are really busy. Tonight my class had an exam, and next week we have a final that I spent several hours putting together today. Last night I had book group; every one read Persepolis and enjoyed it a lot. We had a great discussion (and good food) and I got home late. Then tomorrow night I have Enrichment. Plus tomorrow we're getting new blinds installed and Little Dude has a check up at the doctor. And so on. Lots of things to do during the next week or so. I'm especially feeling pressure because we're planning on leaving on a road trip next weekend. So I might not be blogging much for the next little while. Tonight we went out to take my sister to the train station. I thought of staying home, but I felt like I needed a break since I had spent all day sitting on the couch. Mr. Fob was grateful that I came to help navigate around the yucky traffic, and I was glad I had not been home when we got back to our apartment and discovered this. Stupid football. Stupid alcohol. Stupid college students. Stupid rivalry. PS--We have double pane windows so there is no glass in our apartment and no cold air coming in. We talked to the university police and hopefully we'll get it fixed by housing on Monday. I'm also going to talk to the housing office about some sort of fence around our patio, because I'm tired of things getting stolen and people throwing trash on our porch. I'm thankful that dinner turned out beautifully and everything tasted great. It was even ready on time and we only had one semi-major mishap. I tried the Alton Brown recipe for turkey from the Food Network and stuck the turkey in the oven to start at 500 degrees. After 20 minutes smoke started filling the house. It turned out that the old Pyrex pan I was using to cook it in split right down the middle. The grease was spilling out and burning all over the oven. We got the turkey in a new pan and cleared the air and the rest of the dinner went well. It could have been a lot worse. I'm thankful my sister came to visit. We love having her come and she's already been a lot of fun. Plus she brought Williams Sonoma peppermint hot chocolate and a fun Thai martial arts movie that we watched tonight. And she cleaned up the kitchen this evening. When I asked Mr. Fob last week if I should plan something for our anniversary, he told me that he was planning a surprise. I figured we'd just be going out to dinner or something. After we drove up to the ferry terminal I really started to wonder how late we were going to be staying out. It turns out that we didn't come home until 9 this morning. We had a lovely overnight stay here in a suite that was almost as big as our apartment, but had the added bonus of no children and a jacuzzi tub for two. It was perfect. Mr. Fob packed some frozen Thai food from Trader Joe's for dinner and we had a lovely breakfast this morning in our room (this inn puts it in the fridge for you the night before so you can warm it up and eat it when you want). We were rushed this morning because we had to get back early for our babysitter, so we didn't get to see much of the island or anything, but it was still a fabulous getaway. I guess today I am thankful for surprises. Today I am thankful for six years of marriage. Happy anniversary to us! Today I am grateful for Dr. Seuss. He's pretty much the best children's book author ever. I remember one time as a kid on our way to the beach my mom pointed out his house and thought it was amazing. When I was four or five we all got Dr. Seuss books from the Santa at the Christmas party at my dad's work. For several years afterwards one of our favorite games was "oobleck", in which the floor became oobleck and we had to jump on furniture, toys, or books to escape. My mom hated it. Tonight I am grateful for sleep. I've always had trouble getting to sleep, but once I'm there it's hard to get me back out of bed. Nothing makes me happier than snuggling up underneath warm blankets in my cozy pajamas. I'm also grateful that my children have both learned to sleep all night in their own beds. Little Dude usually goes to bed quite easily these days and he still takes a nice nap during the middle of the day. I think that small children sleep so much as a defense mechanism--if I didn't get that nap time break during the day we'd both be sick of each other by dinnertime. Tonight I'm exhausted; time to log off and go to bed! The summer before my freshman year of high school I decided to try out for the drill team. Even though I was pretty much a nerd, I secretly envied the drill team girls. My tryout experience was pretty much like something out of Beverly Hills 90210. For some reason I decided to try out for "banners"--the girls who marched in front with the metal signs spelling out my high school's name. There weren't very many spots, so this was the most competitive section of the drill team, but I didn't realize that before I got involved. I lasted for only two days in the tryouts; the other girls laughed at me, wouldn't give me a practice banner, and basically made my life miserable. I went home, cried, and decided that I was just a nerd and that was never going to change.